For some, ingesting marijuana is a better way to reap the benefits of cannabis, and various providers are eager to meet that demand. Every few days, Chad Crandall and Emily Isler take a break from tending to the chickens, pigs and crops and head to the kitchen to cook up their weekly supply of marijuana-infused maple sugar candies. The soft-spoken caregivers sell their sweet little confections, which are made from their friends’ maple syrup and marijuana the couple grow on their Jay farm, to their medical marijuana patients. 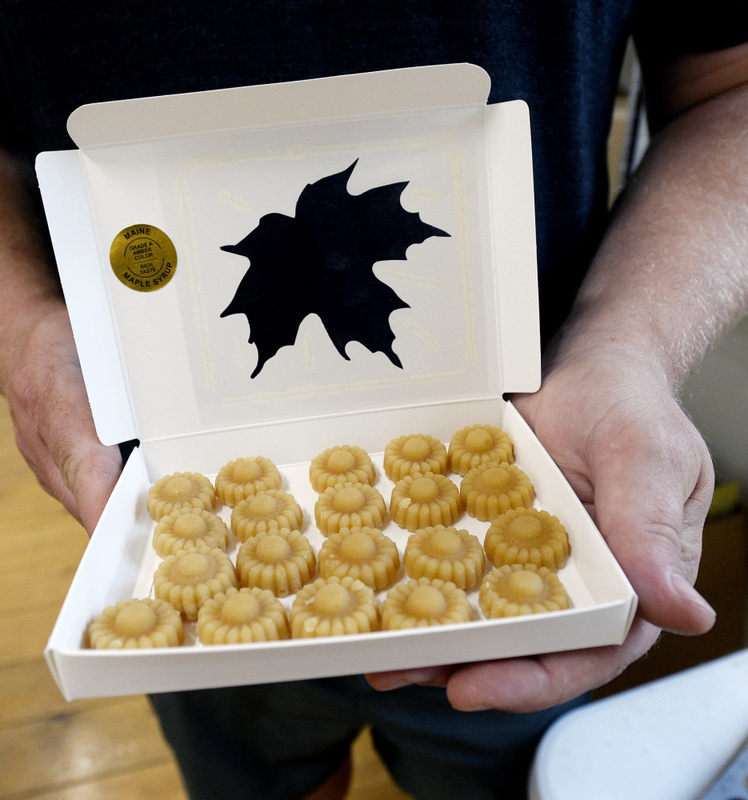 The maple sugar candies are Crandall and Isler’s most popular form of medical edible cannabis, or medibles. Some are made with a kind of marijuana extract that can get you high, while some are not, but they all were formulated to provide symptomatic relief for nausea, pain, vomiting, and spasticity, the kind of palliative care that even the American Medical Association’s Council on Scientific Affairs deems appropriate. A package of 20 candies, whose taste doesn’t hint at its cannabinoid content, costs about $50, plus a $4 state sales tax. 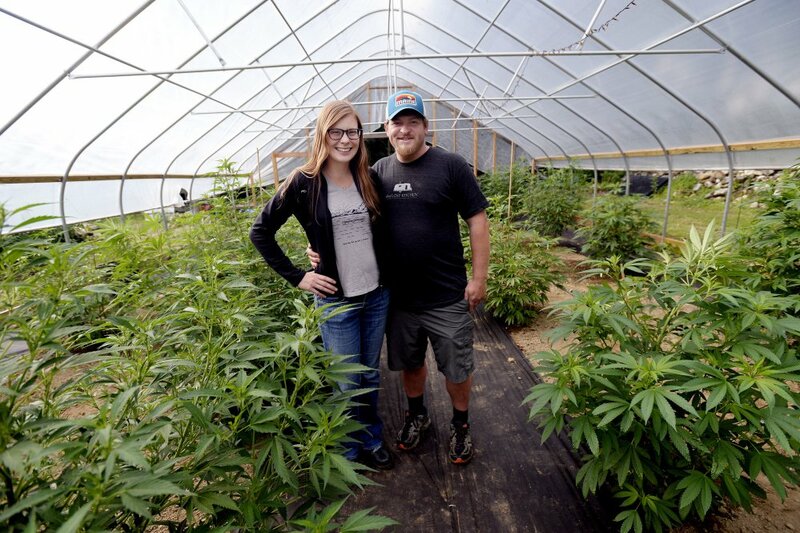 This is the face of the fastest-growing segment of Maine’s medical marijuana market. In states where recreational marijuana is legal, edibles represent 10 percent of the total cannabis market, and that number is expected to grow, prompting many Maine medible producers, including Crandall and Isler, to begin ramping up with an eye on Maine’s looming recreational retail market. Edibles are cannabis-infused foods such as candy, beverages and prepared foods like cookies, muffins and even bacon. Depending on their purpose, medicinal or recreational, they are made with a concentrated cannabis extract that is often added to butter or oil that contains THC, the psychoactive agent in cannabis, or a cannabinoid like CBD, a non-psychoactive compound, or a combination of both. Mainers bought $2 million worth of medibles at a medical marijuana dispensary in 2016, according to state tax records – about 7.4 percent of the $26.8 million in total sales reported by Maine’s eight licensed medical marijuana dispensaries. The year before, the $1.2 million medibles market accounted for 5.4 percent of the dispensaries’ total sales. 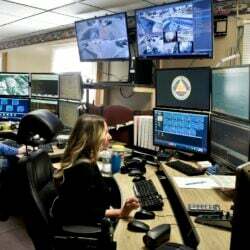 That market doesn’t include sales by Maine’s 3,200 caregivers – the small-scale growers licensed by the state to sell cannabis to five patients at a time – like Crandall and Isler, although that market is likely sizable. 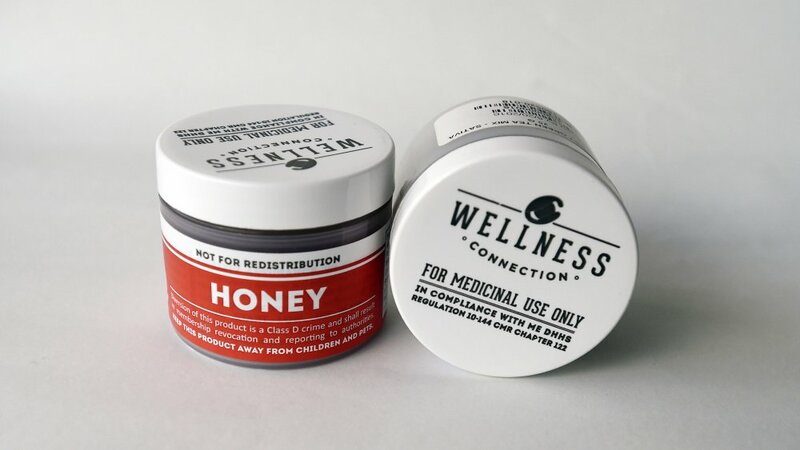 Caregivers, like the owners of Pot & Pan Kitchen in Portland, are now so deep into the edibles world that they produce wholesale goodies exclusively for the caregiver and dispensary market. 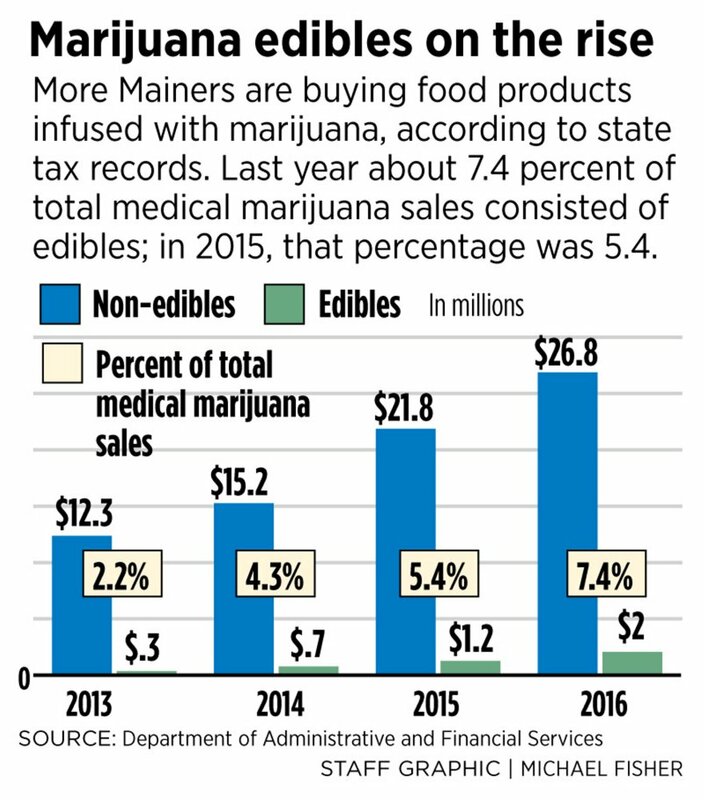 The state doesn’t track caregiver sales, so it can’t estimate their edible sales, which are taxed at a higher tax rate than non-edible marijuana. Those who grow, prepare and sell medibles say many of their patients are used to ingesting medicine, so edibles feel familiar and medicinal. New extraction processes allow for smaller, more precise dosing in edibles now than even a few years ago, said Tim Smale, a co-founder of Remedy Compassion Center in Auburn. That is especially important now that doctors are increasingly likely to prescribe small doses to their patients, he said. It can be easier for patients to get small doses right with a capsule than, for example, a vaporizer. Customers of every demographic will buy medibles, with older adults purchasing at a “somewhat higher rate” than younger ones, said Smale, who is also head of the Maine Dispensary Operators Association. Because of their convenience, variety and discretion, and their fast growth, Smale expects that medibles will account for about 20 percent of all dispensary sales in Maine by 2018. Jeff Rowse has been taking two droppers full of cannabis-infused olive oil at night before he goes to sleep for the last three years to alleviate the symptoms of both irritable bowel syndrome and arthritis brought on by years of working on his feet, including 13 years as a merchandiser for regional CVS stores and a recent stint as a bartender at a craft brewery in York. The 48-year-old South Berwick man uses one oil that has cannabidiol, the non-psychoactive agent known as CBD, and a second that includes tetrahydrocannabinolic acid, or THCA, the non-psychoactive precursor to THC that is found in raw, live cannabis. With them, he can keep the abdominal pain and bathroom runs at bay overnight, and awake in the morning with knees that don’t hurt. Rowse had been using medical cannabis for a while before he discovered edibles at Canuvo, a Biddeford medical marijuana dispensary. To Rowse, it made sense for someone with a chronic digestive condition to use edibles, absorbed through the digestive system rather than through the bloodstream like inhaled cannabis. He started off with capsules but switched to the oils to save money. Rowse is a longtime supporter of medical and adult-use marijuana who publishes an online cannabis magazine, so he probably knows more about his medicine than most medical cannabis users. He said he did a lot of his own research to find his way to his current medical regimen. But he would like to know a lot more about how cannabinoids work for him. At this point, he just knows they do. Given other states’ experiences, edible cannabis is likely to gobble up a large share of Maine’s pending adult-use marijuana market. In Colorado, edibles represented about 14 percent of 2016 legal cannabis sales, up from 12 percent in 2015, according to BDS Analytics, a consulting firm that tracks the cannabis market. In Washington state, edibles accounted for 9 percent of the market in 2016, and in Oregon, where edibles weren’t allowed in the adult-use market until July of that year, edibles quickly gobbled up 7 percent of all cannabis sales. From 2014 to 2016, edible sales in these states passed the half-billion mark – 10 percent of the total $4.7 billion cannabis market, BDS found. States with legal medical or adult-use cannabis markets have struggled with how to regulate and label the potency of edible products. Unlike smoking, whose impact can be felt almost immediately but wears off fast, those who ingest an infused food may not feel the effects for up to two hours, but when they do, it can be more intense and last longer than smoking. This delayed effect can lead to overconsumption, especially among inexperienced users. Other states with legal medical or adult-use cannabis markets have opted to set a typical serving size between 5 and 10 milligrams of THC, but an infused cookie might be made up of eight servings. In other states, the companies that make edibles have sometimes struggled to keep THC doses consistent from one edible batch to another. Washington state has enacted strict regulations that ban edible shapes, colors and images that might appeal to children, which means the most popular form of edible in states with legal cannabis sales, the gummy, can’t be sold there. Maine lawmakers are still wrestling with potency standards for the adult-use market, as well as how to label an edible in a way to prevent the overconsumption of THC by adults. They also want to make sure cannabis-infused foods are easily distinguishable from non-infused to avoid consumption by children, perhaps by requiring them to be made in baking molds marked by a marijuana leaf. Maine law does not require medical marijuana dispensaries or caregivers to test or label any of their marijuana, including edibles, for potency, although some do it anyway to keep their customers happy and help them dose properly. The only potency law in effect right now requires that if the dispensary or caregiver does label a product, the label must be accurate, although the state doesn’t test to confirm that. Cost also plays a major role in the growing popularity of edibles, according to Glenn Peterson, a founder of Canuvo. Smoking marijuana for 14 hours of pain relief would require about a quarter ounce of marijuana a day, which would cost $50 to $75, he said. But smoking a bowl once in the morning for fast pain relief, then following up with two low-dose chocolate coins for a slow-acting, long-lasting relief, would cost $8 a day. For patients who medicate every day, that cost savings add up fast, he said. Canuvo’s biggest sellers are DOOTS, a 3/8-inch hard candy square with just 1 milligram of cannabinoids, which is the medical part of the plant. This candy is the foundation of Peterson’s “go low and slow” approach to introducing a new patient to cannabis and finding the right dosage. Patients will start with just one candy and add one more each day until they have their pain, nausea or symptoms under control. While so-called microdosing is becoming increasingly popular, edibles also allow for megadoses of medicine for those who are severely ill. Some people want the state to crack down on dosing, and require edibles to be broken down into single serving sizes of no more than 5 or 10 milligrams each, and require commercial kitchen licenses for edibles preparation. But some participants in the medical marijuana market, like Sanford caregiver Pete Tranchemontagne, hope the state leaves medical marijuana edibles alone. Entrepreneurs are diving into the edibles market. From 2014 to 2016, the number of edible brands in adult-use states jumped from 76 to 350. Tranchemontagne is in discussions with a food entertainment network about developing a cannabis-based food TV show. While Maine laws currently require dispensaries to make their own edibles, some companies, like Pot & Pan Kitchen in Portland, have launched to serve the caregiver market in hopes of jumping into the adult-use market next year, once retail rules are set. Co-owner Keri-Jon Wilson said Pot & Pan fields calls every day from people who want to buy their products, which focus on local and organic ingredients used to make a range of gourmet candies and cakes. Their biggest seller is a kind of sour gummy called Medicubez, with a 10 mg dose of THC in each piece that makes it a popular starter for someone new to edibles, Wilson said. Wilson and her partners are caregivers and have been making edibles for themselves and their patients for about four years. They started to focus on edibles about a year ago, when they recognized a need in the local market. They opened a processing facility to extract the oil from patient and caregiver products and turn them into custom foods. They have already expanded once and now employ three full-time employees. Breaking into the market did have some hurdles, Wilson said, including setting up a commercially licensed kitchen – all edible products, even cannabis-infused foods, must be made in a commercial kitchen in Maine – in a friend’s vacant Portland house, and finding a way to grow their product line and brand while still operating under the restrictive volumes of the state’s medical marijuana program. They are waiting to see what the new recreational rules might require for cannabis production facilities like theirs.